It is well and truly festival season and although the sun is now shining, last week the rain fell and it was less with excitement more with trepidation that I set off in the wet for Deer Shed Festival last Friday. I’d heard very positive things about Deer Shed and it was a festival I wanted to experience. So much so that I’m happy to disclose that I emailed them and pitched the possibility of writing about it on my blog it in return for a pass and they agreed. Sometimes it feels as if all the interesting stuff goes on ‘down South’ and it’s nice to have a ‘local’ festival. Located in North Yorkshire it’s a short journey for us. Not far from the A1(M) the site is very accessible from short or long distances. We were a group of 4 families, three local and one from London. The rain ceased enough for us to pitch our tent and then returned for a brief shower but with warm clothes, wellies and waterproofs and the expectation and excitement created by the sights and sounds of festival in the next field meant the rain didn’t matter. The camping is a short walk from the car park with plenty of trolleys for hire to shift the gear. It’s a family festival and there was plenty of room for groups to camp together around gazebos with good space between tents. Personally, I don’t like being so close I can hear what is going on in someone else’s tent. Loos were plentiful, cleaned regularly and well situated in and around the camping area. As a parent that is a big tick. In a group of 6 adults with 6 children “I want a wee” seemed to be said every 20 minutes. The only downside being the children were less keen on the eco loos in the main arena and this meant a walk back to camping area for portaloos. The festival is organised around one main arena/field. My initial reaction on entering was “this is small” but actually that’s the beauty of it. Everything in one field works well with small children; less tired little legs and knowing that you’ve easily explored it all. Any lost children, and we lost one, were quickly reunited. There are little gems tucked away such as the tiny Deer Shed stage which offered a very close up experience. On Friday night we saw a couple of bands. The headliners cool and timeless St Etienne and Janis Graham, not a woman lady, actually a group of young lads, with a vibrant reggae based trumpet sound. With three main spaces and two of those covered there was shelter from the elements. Happily, blue skies and sunshine was the order of the weekend. Saturday was all about picnic blankets, camping chairs and relaxing while bands played and parents enjoyed a pint of beer in the sunshine. Plenty for children to do in terms of crafts and entertainment. We passed a lovely hour making bead bracelets, while the Washington Irvine band played in the background. Music tents within listening distance from children’s entertainment is a great compromise. The selection of food stalls was small but varied. We enjoyed pizza from a wood fired stove at about a fiver. None of the food we had disappointed, all freshly prepared and reasonably priced. Deer Shed is run by a family and there are some refreshingly simple ideas like leaving a load of large cardboard boxes out. What small child doesn’t love playing in a box? A big space beside the family camping with swing ball and space hoppers. While there was lots of music for discerning adults there was also entertainment aimed at children on Friday night we caught some of the Greentop circus show which my son enjoyed. We particularly liked the hula hoop woman and the skeleton compare spent the interval talking to children. 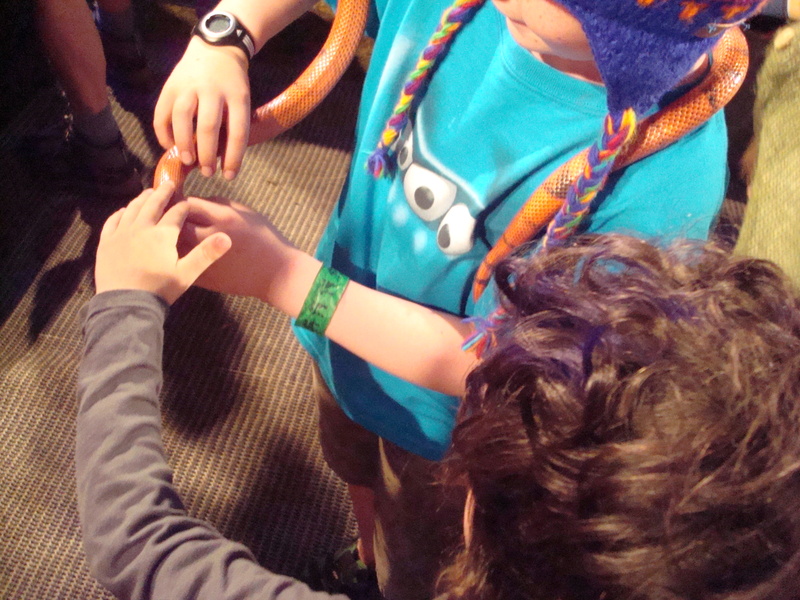 My son loves animals and reptiles and the one thing he wanted to see was Simon Airey’s Animal Exotics on Sunday. We arrived at the tent just as the show was beginning, having had problems locating where the show was actually happening. It was crowded and we squeezed into a small gap. Clearly this was a popular choice. The area in front of the stage had been circled with sofas and arm chairs which created a small space in the centre for sitting. Simon gave a punchy, informative and fast flowing commentary on all the animals and reptiles. He also offers a hands on experience. A volunteer is selected from amongst the children and given an animal. 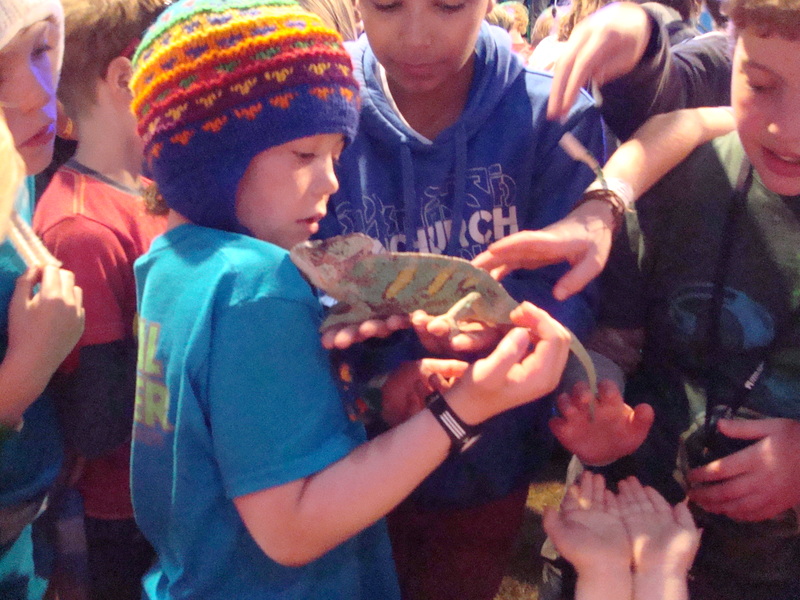 They then wander through the crowd giving other children the opportunity to touch and get close up. However, this resulted in children clambering over each other, bigger ones standing to see and be seen for volunteering, whilst smaller children couldn’t see and while we reassured that they would get the opportunity ‘patience’ after two late nights aren’t top of most children’s skill set. I can only describe it as slightly, (with the emphasis on slightly) chaotic. I will add that my friend gave up and left. We stayed and were rewarded with close up’s of amongst other things; snakes, chameleon, a giant rat and giant cockroaches. I say ‘rewarded’ that would be from my son’s perspective obviously. As a parent I want to give my son experiences that inspire and fire his imagination and getting close up to replies is just that. Because Deer Shed is small we could get right up to the front to the stage and he could see the guitars and singers which he thought was brilliant. That makes music exciting. Apart from the slightly manic experience of Animal Exotics Sunday was a very laid back affair with music to match. Cherry Ghost a 6 Music favourite were the main act on Sunday afternoon to close the festival. Described by The Guardian as “Northern Melancholy” I wouldn’t say I loved them but the style suited Sunday and they were very popular with the crowd. There were long queues for the Big wheel, which as far as most children seemed concerned was more than worth the wait and some queues for food but generally it was a relatively queue free weekend another bonus with small children. Thoughtful additions such as a group of wood burning stoves in near the uncovered main stage for added warmth on a cold July night. The film Monsters Inc showing first thing on Sunday morning in the Dock Stage tent. The equivalent of sticking them in front of the TV after a couple of late nights. Perfect for over tired children and slightly hung over parents. Sometimes, you need that breather to re-energize for the day ahead. Leaving was as easy as arriving, no queues. The crowd is definitely majority family. The atmosphere relaxed and I would very much recommend. If you’ve never camped festivals are easy because really you only need your tent. Food and drinks are all available. At Deer Shed there was a tea and coffee stall and food supplies stall in the camping area. Pitch you tent and enjoy. If you love camping and want to combine it with effortless on site entertainment to please both adults and children then this family friendly festival is perfect. At £69 for an adult weekend ticket, children 6 + £20 and children under 5 free it is reasonable compared to other festivals. The music emphasis is indie, think 6 Music, there is plenty to do for both children and adults, the taster I’ve given here and things we didn’t get to including comedy performance and science and technology workshops. In my view that represents very good value. Looking Forward to Deer Shed Festival in 2013. Disclosure: Courtesy of Deer Shed Festival I received a pass for myself. My son is under 5 and entry is free. In return I agreed to preview and review Deer Shed. Words and opinions are all my own. Wow! Sounds like you had a fab time, and a great festival for families. Great write up! we did and thank you! Sounds brilliant. Shall add it to my list of must-dos for next year…. Looks utterly fabulous-wanted to attend but figured next year sans bump would be easier! Stunning photos too! Be a breeze for you – so close! I’m currently working on an article about small festivals in the UK and have featured the Deer Shed Festival; I’m looking for people who have had a positive experience at the festival and seeing as you have I was wondering if you wouldn’t mind answering a couple of questions for me please? I’d appreciate it so much!